Designed for high-accuracy temperature sensing and measurement in Li-ion battery power applications, Ametherm’s PANR 103395-342 NTC thermistor probe assembly combines a specially designed ring lug for battery mounting with a high dielectric voltage rating of 4000 VAC. The thermistors are manufactured from a specially formulated metal oxide ceramic material that is extremely accurate in sensing temperature and is ideal for electric vehicle (EV) batteries, off-grid energy storage, and alternative energy applications. Providing a high-stability replacement for less-accurate thermocouples, the PANR 103395-342 experiences minimal drift from its initial electrical values. The device offers resistance at 25°C of 10kΩ, beta of 3950°K, dissipation constant of 8mW/°C, thermal time constant of 10.0 s, and an operating temperature range of -50 to + 180°C. The RoHS-compliant assembly features 18-AWG stranded Teflon-insulated lead wires. 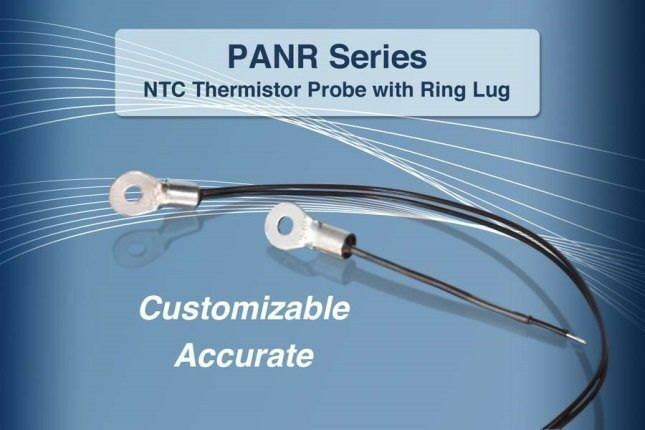 Ametherm’s NTC sensing thermistors include the PANR 103395-342 probe assembly with a ring lug for easy and secure mounting to battery terminals. The device is extremely accurate and experiences minimal drift from its initial electrical values to provide a high-stability replacement for thermocouples. The temperature probe features a high-dielectric withstand voltage, resistance at 25°C of 10kΩ, beta of 3950°K, and dissipation constant of 8mW/°C. In addition, Ametherm’s MM35-DIN series of inrush current limiting NTC thermistors designed to withstand high input energy of 1200J and steady-state currents from 50.0A to 80.0A at 680V. Offered in DIN-rail-mountable packages, these inrush current limiters are optimized for high-power industrial and green energy applications, including variable frequency motor drives, wind turbines, large inverters, single- and three-phase motors, and transformers. The MM35-DIN series features resistance at 25°C from 0.2Ω to 1.5Ω, with maximum power of 38.4W.